About ten years ago, I was at the Glastonbury Festival. It was a quiet moment between acts and I was just vaguely wandering around. I spotted the tiny stall alongside the LeftField and meandered over there to peruse the books. There was a tent flap hiding my view of half of the interior, I didn't see who was sitting there until I was right inside. In a space about six feet by three feet was me and Tony Benn. He'd been quietly signing books. Not making a big fuss about it, just leaving those autographs in copies of his diaries for the delight of those purchasing them here. As soon as I walked in, he smiled up at me and put down his pen, waiting to see if I would say hello. I did. It was a gabbled, over-awed affair, but I managed a greeting anyhow. For about ten or fifteen minutes, it was me and Tony Benn chatting about the world, and the Stop the War campaign. I'd have been content to listen, wide-eyed and slack jawed, as he spoke some monologue to me. But he wasn't having that. He was interested in what I had to say. He wanted my thoughts. It was a conversation. One initially beset by me solely afraid that I sounded stupid and inarticulate. He put me at my ease so much, that it was more like talking with an old friend. After a while, the stall volunteer came back with cups of tea for himself and Mr Benn. I shyly asked if they wouldn't mind a picture being taken, me with Tony. They didn't. The lad behind the counter took the photograph, just as others drifted in. It was crowded now, and I felt that I'd had my time. Tony Benn shook my hand like I mattered, and said goodbye. I lost my camera that festival. I never got to see the photo taken in the LeftField. But the bigger loss came today, on March 14th 2014, when his family announced that Tony Benn had died. The above small anecdote might give some insight into why that matters so much. He was a radical politician with his finger firmly on the pulse. He was proved right time and time again, and could always be trusted to speak for us on the left. I didn't write an obituary for Margaret Thatcher. There would have been too much vitriol. Such things were best left to HollieT, who could at least be objective about it. Perhaps I shouldn't write an obituary for Tony Benn. The emotion is quite opposite, but amounts to the exact same lack of objectivity. I hope that HollieT steps into the void again. All over the internet, people are going to see the same distraught emotions pouring out from their politically left-leaning British friends. It is that big a deal. But also likely to cause some confusion amongst those international readers, who maybe never encountered him. Politician, writer and orator, Tony Benn really knew his stuff, and how to articulate things so that we knew it too. He was born, on April 3rd 1925, into a very politically active family. His father and grandfather were both Members of Parliament before him. For those of us who encountered him in later life, it's a bit of a shock to realize that Anthony Wedgwood Benn also came from an aristocratic family. His grandfather was awarded a baronet. His father was made Viscount Stansgate. This ruling elite is everything that Tony Benn ever railed against. He put his money where his mouth was in 1960, when a double personal loss meant that both his father and his elder brother weren't there to hold the hereditary peerage. Tony Benn was the 2nd Viscount Stansgate, and he wasn't at all pleased about it. He had initiated a campaign, which would allow peers to renounce their title, before his father had even passed away. When William Benn did die - in November 1960 - his son was automatically ineligible to sit in the House of Commons. This prompted a by-election in Bristol South East, where Tony was the current parliamentary representative. He refused to give up his position without a fight, and was duly re-elected against the laws of the land. 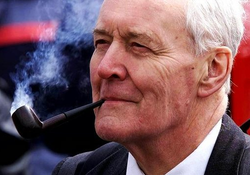 An investigation proved that voters knew very well that Tony Benn was ineligible for the position, even as they voted him into it. The furor caused the Peerage Act (1963), which gave people like him the right to surrender their titles. Twenty minutes after it was passed, Viscount Stansgate waltzed into the registrar's office and emerged as plain, old Mr Tony Benn, Member of Parliament for Bristol South East. I've spoken with Tony Benn, and I've observed him on many occasions - at the various protests, rallies and festivals where our paths crossed - speaking with others. He always gave the impression that we were all equals; that every voice counted; that every mind and mouth had something to contribute to the discussion; that we could move mountains, if we just all worked together. That was part of his iconic greatness. He discerned the greatness in us all and made us want to live up to his vision of ourselves. He was always a member of the Labour Party. But by 1970, his radical views had moved him just about as far into the left as it's possible to go. The Civil Service can frustrate the policies and decisions of popularly elected governments. The centralized structure of the Labour Party led to a situation where the leader could run it as 'his personal kingdom'. The power of industrialists and bankers to get their way by use of the crudest form of economic pressure, even blackmail, against a Labour Government. The role of the British media, which 'like the power of the medieval Church, ensures that events of the day are always presented from the point of the view of those who enjoy economic privilege'. Those themes would continue throughout the rest of his career, especially after he left parliament 'to devote more time to politics'. He's the political grandfather of just about every Socialist in Britain right now. His loss feels like a death in the family. As I write this, I'm constantly flicking back to read the live reaction to the death of Tony Benn, as streamed by the BBC. I'm struck by how many people who, like me, are commenting about when they met him. There's an inherent theme running through it all. Tony Benn was somebody who was always out there, mixing with the public, hearing views and marching at the spearhead of mass campaigns. He was a man who knew how to lead, but also how to eloquently speak the truths that so many of us were thinking. He was there at the rallies, delivering those firebrand speeches, then sticking around to meet and greet. He was there on the streets, personable and approachable, well into his eighties. I close my eyes and I picture him, not in Parliament, but at the Glastonbury Festival. An elder statesman, calmly smoking his pipe, while hippies, crusties, old punks and new, greebos, Goths and hipsters milled around. He knew them all from the first smile. He valued them all. He was one of us and now he's gone. But his legacy burns so brightly. It's going to take a lot of us to pick up, and carry on, with such a large dropped baton. There's enough. He left enough. It was 'Free at Last' that Tony Benn signed for me in that Glastonbury Festival tent. I'm really going to miss him. He was anything but harmless. He inspired, educated and informed so many of us. We now know to carry on his ideals. In the Tony Benn film, the late, great Mr. Benn suggests that the nation see him as a national treasure...kindly, a gentleman and harmless, He disagrees with the harmless bit and so do I. Thankfully, there's enough of us to spread his message... and his message will not hurt us, but gain even more momentum amongst the younger generation. Look up, right up....Mr Benn might just become the 'most dangerous man in Britain' and it will be so hard to hurt him posthumously! Hear, hear, and thank you. Good to see you around again too. A great tribute to Tony Benn Jo. He was unique in the world of politics - and I doubt if we'll see his like again. I suppose that was inevitable too. He was lampooned in the right wing press all of his life. He was. I was watching the Andrew Marr show on Sunday and found out that now publications are starting to slate him. Thank you very much. 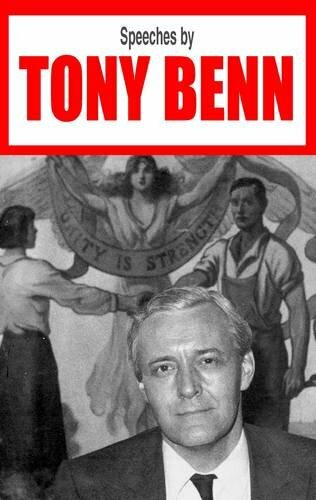 I've been pleasantly surprised by how many people who, though not agreeing with his politics, have spoken highly of Tony Benn personally. He was quite an icon. I was gutted when I heard the news yesterday. When I did A-Level politics, his name would pop up so much and I ended up researching him in far more detail than I needed to for the exams. I didn't agree with everything that he stood for, but he always seemed like a kind-hearted man who just wanted everyone to be treated equally and fairly. You've done a great job on this, Jo. Thank you very much. I'd love to read what you had to say too. Mine was very fangirl-y. But then that's easy to do with this particular politician. Jo, I've only just seen your message on Twitter (Must check notifications more frequently) Yep, I'd be happy to write about Tony Benn, but think you've already done a fine job!